For those of you not yet familiar with lazymeal, it’s an online food ordering platform that is focused on recommending the tastiest meals in greater Vancouver. It’s simple, just punch in your postal code and peruse the menus of establishments in your area, place your order, and voila! lazymeal delivers. They’re partnering up with the local food blogging community to evaluate the restaurants you can order from on their sites, and we were lucky enough to get an invite to one of their mashup events. 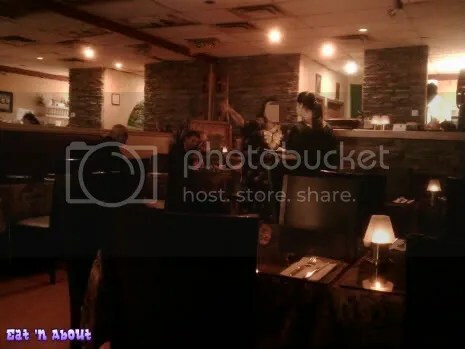 For these reviews (and you will probably see more of them in the near future) we will be focusing on the take-out aspect of the restaurants, so don’t expect any info on the service and decor etc. But we think all in all these reviews will be more informative to our readers since we will get to sample a wider selection of the menu than usual, because the food is the most important aspect after all, right? And don’t worry, we aren’t selling out; we’ve been encouraged to be completely honest with our reviews. Enjoy this write up of Handi Cuisine! First up we had the Mixed Platter ($10) and Chutney Trio ($2). 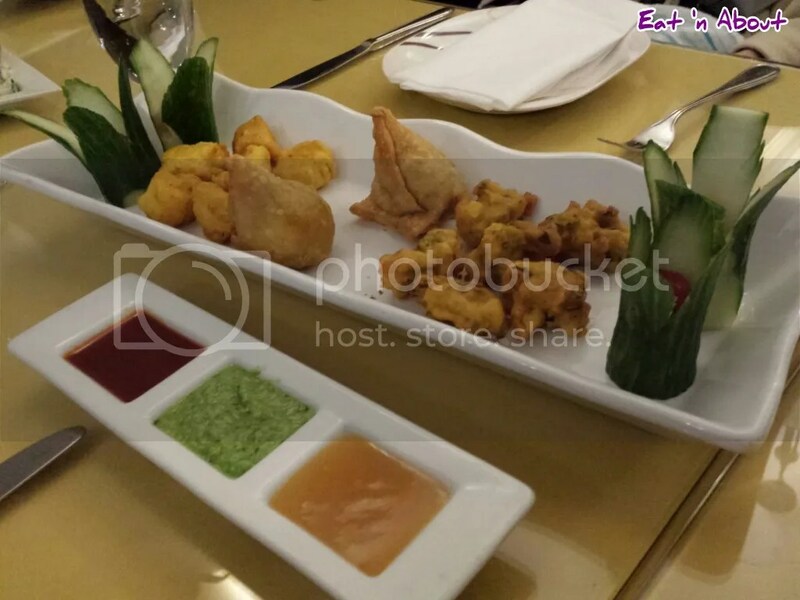 It consists of vegetable samosas, chicken pakoras and vegetable pakoras. The samosas in particular stood out from the crowd; they contained a pretty complex spice blend compared to your average restaurant samosa. Wendy said it tasted Christmas-ey, and I agreed. Cloves and nutmeg perhaps? Maybe some ginger? I don’t know for sure, but you could tell by the dark colour of the potato mixture inside that there was a lot going on in that spice blend. The chicken pakoras had decently sized chunks of moist meat and tasted great with the spicy mint chutney. The tamarind was of the usual variety that normally come free with samosas and the mango chutney was really sweet. If you go for this platter I’d suggest getting the chutney to go with it. While the samosas could stand on their own the vegetable pakoras might be a bit dry without. 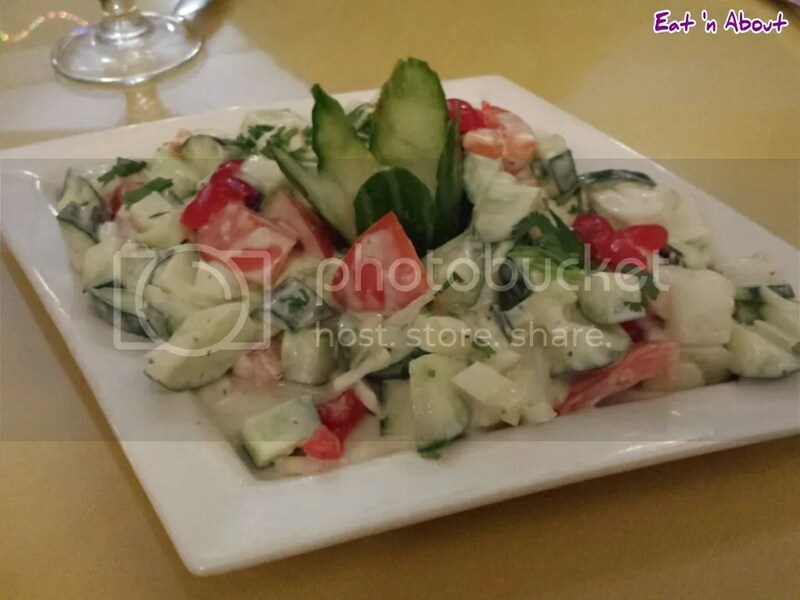 Along with the appetizers we tried their Cucumber Salad ($6). Some of the red you see in the photo is tomato, and some is…maraschino cherry! Pretty unexpected but it actually went quite well in the salad. They use it for garnish in several dishes, and it isn’t necessarily meant to be eaten with the meal but in this case it worked. 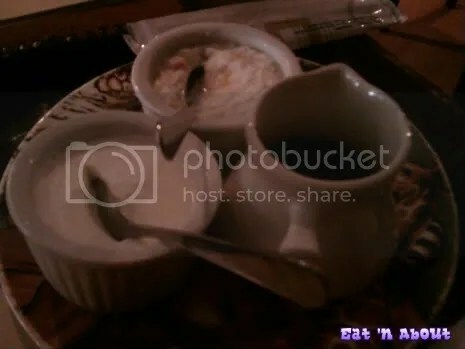 The yoghurt-type dressing was cool and creamy (Wendy found a tinge of sweetness) and the whole dish was very refreshing. Been wanting to try foods of a different culture for a while. Finally my chance came when I went to dinner with G. He gave me 3 choices: Korean, Ramen, or African. I picked African right away. 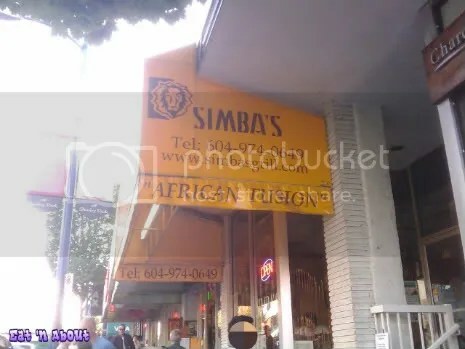 So that became Simba’s Grill on Denman (they also have a location in Burnaby). Apparently another coworker had raved about it. I immediately looked up the menu online and I’ll have to admit, I was slightly disappointed to find out that it’s more “African Fusion” and the food is more like Indian-African. In other words they really serve curries and such. They do also serve kebabs hence the “Grill” part of their name. But then, I guess I wasn’t really hoping for lions and elephants. The interior is nicely decorated. Very low lighting so it’s quite romantic really. Aside from the boss guy, they servers were Japanese dressed in (?) African attire. From the start they placed a place of condiments down. The server did forget to bring us water though, we had to ask for it. From the top, is a savory coconutty sauce, next is a spicy tamarind sauce and then it’s a thick yogurt-type dip. The boss guy came around to every table to greet everyone. When he arrived at ours, G asked for recommendations. He asked if we liked Lamb and I do, but unfortunately G doesn’t, so we digressed. He did give a few recommendations such as the cream curry and the grilled lamb. Alas, we did not go with his recommendations. This would be the first post ever of us doing some home cooking!! Mind you not entirely from scratch but it’s the closest to home cooking we’ve done ever. We like Indian food. I especially enjoy Korma. A couple years ago we found that Superstore’s President’s Choice has come out with a series of Indian sauces for you to make your own Indian food at home. Back then it was just $2.99. Now the price has been hiked to $3.99. They’ve also come out with it in their Blue Menu series also. If you don’t know, that’s their healthier version. So it’s very very simple to make. We don’t use a lot of ingredients. Pick your choice of meat (or veggie if you’re a vegetarian), and any other add-ins if you like. As shown above, we chose chicken and onions. So brown the chicken in a pan. It doesn’t have to be fully cooked as you’re simmering it with the sauce later. The meat would be in smaller pieces anyways so it’ll cook through later. Having heard good things about the lunch buffet at Saffron, I dragged Boyfriend out to Burnaby on a Monday afternoon to try it out. It was relatively easy to find, located on Kingsway. Once you step into the restaurant you are surrounded by the wonderful aroma of Indian cooking. There’s a bigger selection at this buffet than other restaurants (so I assume). They even have naan on their buffet menu. These are served fresh on your table, you don’t have to go get them from the buffet area. The naan was wonderful. Fluffy and crispy, and not charred and burned like other restaurants make them. This is refillable. They have quite a selection of curries available: Curry Chicken, Butter Chicken, Chicken Korma, Mushrooms with Spinach, and probably 2 more that I don’t remember. Above are Butter Chicken (left) and Chicken Korma (right). I really enjoyed the korma with naan, the butter chicken I didn’t like so much. It was too tomato-y and sour to the “usual” Butter Chicken I have. The Korma was creamy and had lots of big chunks of chicken in it. That goes for all the curries with meat in them.